PetSystems makes sure that your loving relationship with your furry loved ones stays that way, by bringing you NEW products designed to give pets the training, freedom, fresh air and exercise they need. Which means nothing will get in the way of your special relationship. Please feel free to browse arround and if you would like to buy any of these products online, it's just a click away! 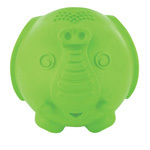 Dogs love to chew, and this toy is designed with determined chewers in mind. 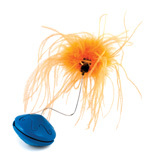 The extra-wide ends of the Ultra Woofer™ toy protect a single ultra-thick rawhide treat ring. The ring is 4x thicker than our regular Busy Buddy® rawhide rings. The toy design makes it more difficult for dogs to get a grip on the rawhide. This difficulty combined with the ultra-thick rawhide rings means this toy will hold a dog's interest for an ultra-long time. 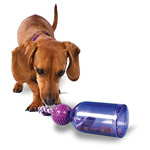 The Tug-a-Jug keeps your dog engaged and motivated to play. 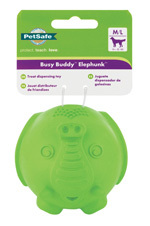 The unique design lets dogs see, smell and hear the food or treats as they roll around in the jug. 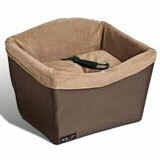 Treats and dry food pop out as your dog tips, tugs and rolls the toy around. 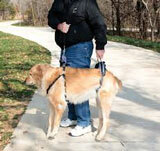 The attached rope is perfect for dogs who like to grab and shake their toys. 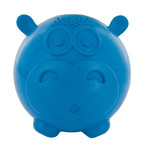 The Tug-a-Jug is perfect for obedience training and feeding meals. 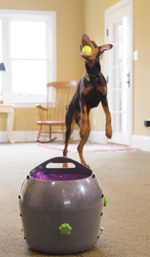 The Hippster™ bounces in unpredictable ways keeping dogs interested in play while the Treat Meter™ randomly dispenses treats, rewarding the play. 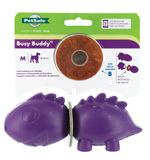 Treat and Train Remote controlled food dispenser emits a tone and rewards the dog, even when he's far away from you! Remote included that allows for precise timing when rewarding good behaviour. Target Stick included (with removable base) and works great for training Fido new tricks, obedience or agility. Great for games too! Illustrated guide and instructional DVD included. The hand-held Clik-R tool makes training easy and fun. Teach your pet that a click means a treat is coming, and you’re ready to train nearly anything, from basic obedience commands to tricks and agility training. The Clik-R tool includes a finger strap which makes it more comfortable and easier to hold than box clickers when training your pet. Clicker training is a clear way to train your pet using a click and a reward to tell your pet he's done something you like. 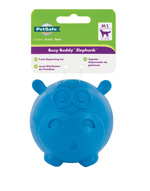 The click sound tells your pet a fun thing is coming – a small, tasty treat or toy as a reward. 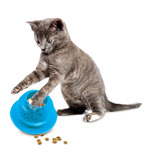 It doesn't take long for pets to understand how to play this game, and once they learn, they're usually eager for more. The rugged, versatile SportTrainer® 700 m Remote Trainer (SD-825E) maximises all of the advanced, industry-leading technology that SportDOG® Brand has ever built into its E-Collars. The system provides long-range capability up to 700 metres, making it especially suited to upland and multi-dog hunting situations. 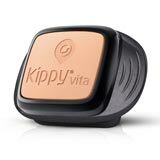 Switch instantly between stimulation, vibration, and tone to fit the communication to your dog’s temperament and learning ability. 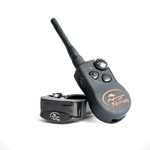 The SD-825E can be easily expanded to control up to 3 dogs by adding a SportDOG® Add-A-Dog® Collars. 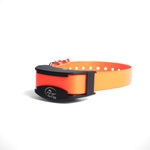 Add another dog to your current SportDOG® Brand electronic collar system or replace a Collar with the SDR-AFE SportTrainer® 450 m / 700 m Add-A-Dog® Collar. This collar has two ranges: Low and Medium. Charger/Adapter can be bought separately if needed. 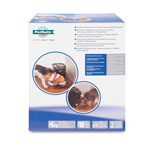 The Drinkwell® Sedona Pet Fountain continuously circulates and filters your pet’s water. 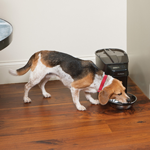 The Sedona Pet Fountain offers 3 litres of fresh, filtered water, and the bowl and ceramic tower design minimizes spills and splashes. 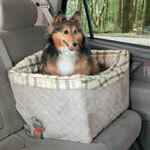 It also provides a large drinking area for pets with large or flat faces. The sound of the falling water is whisper-quiet, making it easily approachable by apprehensive pets. 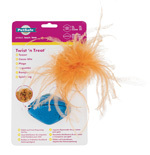 It provides dual filtration including an activated carbon filter that removes bad tastes and odours, while a foam filter captures hair and debris. 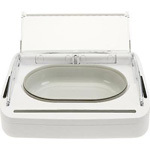 Motion-activated lid - the Sealed Pet Bowl is not microchip or collar tag operated so it opens for any pet. 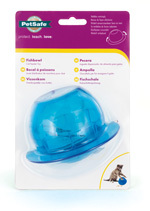 Sealed bowl keeps food fresher and prevents wet food drying out, making it more palatable for your pet. 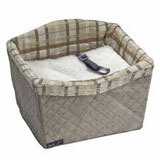 Suitable for both wet and dry food. Bowl capacity 400 ml or two pouches of wet food. Prevents flies settling on your pet's food. 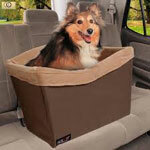 Keeps pet food smells locked away. 6 months battery life (4 x C cell batteries - not included). A low battery indicator will flash when the batteries need changing. With its stylish and advanced design, the Healthy Pet Simply Feed™ Programmable Digital Pet Feeder gives you peace of mind knowing your pet is fed the right portion at the right time whether you are home or away. 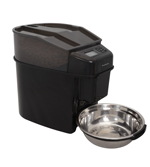 Setup is quick with the dog or cat feeding schedules, with preset meal portions dispensed twice a day. The user option allows you to customise your feeding schedule for up to 12 meals each day, giving you the best way to manage your pet’s feeding routine. Fewer refills are needed with the 5,678 ml (+- 24-cup) capacity hopper, which is translucent for monitoring the food level. The Healthy Pet Simply Feed™ aids you with your pet’s proper weight management by providing a consistent, portion-controlled feeding routine for a healthier, happier pet!